A sound choice for a dependable and affordable all-rounder small-diaphragm condenser. Runs off batteries as well as phantom power, Rugged build quality. Versatility as it can lend itself to a variety of tasks. AKG's C1000 S, now in a new mkIV version, has over the years been a popular choice for anyone looking for a multi-purpose small-diaphragm condenser that can take on a number of tasks both in the studio, onstage and out in the field. The C1000 S is a back-electret design. One consequence of this is that it doesn't have to have phantom power as its power source, being able to run instead from battery power if needed, and thus useful in field recording situations where supplying phantom power could be problematical. There's an on-off switch for the battery and you should get 120 hours use from a set. A red status LED flashes momentarily to let you know that the batteries are in good condition. The top half of the microphone, which includes the wire mesh cap, unscrews easily from the rest of the body, allowing access to the battery compartment. Taking off the top half of the mic body also gives you access to some adjustments - inside you'll find switches for a 10dB pad and for bass cut courtesy of a filter that rolls off frequencies below 80Hz. There are also two other possibilities taken care of by a pair of small plastic appendages that can be clipped over the capsule before screwing the body back together. The first of these is a polar pattern converter that changes the mic's pickup pattern from cardioid to hypercardioid. The second is a presence boost adapter that is designed to improve intelligibility of speech by boosting the mic's sensitivity by about 5dB between 5kHz and 9kHz. 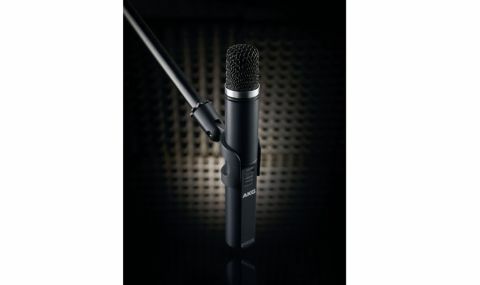 "First impressions of the C1000 S are that it's rugged like a dynamic mic but with extra top end"
First impressions of the C1000 S are that it's rugged like a dynamic mic but with extra top end. On a hi-hat the C1000 S captures all the crispness and sizzle you'd need without getting overly harsh and it is also eminently capable of being an overhead mic on the kit. Of course the way you approach recording a drumkit depends how many mics you have but the C1000 S is a definite asset however many you have, either in an overhead role (singly or in a pair) or as a spot mic on hat or ride. We also got great results on acoustic guitar pointing at the end of the fretboard a few inches out. If you are an advocate of using two mics on an acoustic guitar, a pair of these would do the job and doubtless would come in useful for other stereo micing tasks. Putting the C1000 S in context, with adequate resources a first choice condenser pair for all-round studio work would be a pair of AKG's C414s but if the budget won't stretch, the C1000 S could provide fairly polished results in that workhorse role for around a quarter of the cost. We reckon this is one pretty versatile mic and reasonably-priced, so who is the C1000 S for? Well, for general studio use it's a great asset to have in the mic cupboard; two would be even better and provide an affordable source of decent stereo micing.